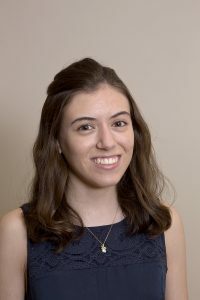 From a competitive field of 13 Delaware high school students, Cecilia Ergueta, a junior from Wilmington Friends School, earned the title of 2017 Poetry Out Loud Delaware State Champion at the state finals held in Smyrna, Del. on Feb. 28. The first runner-up was Shalyn Littlejohn from Hodgson Vo-Tech High School and the second runner-up was Sam McGarvey from Tall Oaks Classical High School. Ergueta’s final recitation, “The True-Blue American” by Delmore Schwartz, earned her high marks with the judges. The full poem can be found on the Poetry Foundation’s website. For her winning presentation, Ergueta will receive $200 and an all-expense-paid trip to Washington with a chaperone to compete at the national championship on April 25-26. Wilmington Friends School will receive a $500 stipend for the purchase of poetry materials. Shalyn Littlejohn, the first runner-up will receive $100, and Hodgson Vo-Tech High School will receive $200 for its school library. To learn more about the State Finalists and for hi-res photos from the event, please see our page here.